With less than a month to go to the biggest bout in boxing history, some pundits have taken to reflecting on the past when it comes to finding quality opposition for the men of May 2nd. Perhaps it’s just another symptom of a sport in decline, but the fantasy fight is in full swing and scribes have pitted the silky skills of Mayweather against those of the Sugar Ray’s, Sweet Pea Whitaker and the truly brilliant ‘Homicide Hank’ himself Henry Armstrong. Likewise, the question has been asked as to how Manny Pacquiao would have fared against Roberto Duran, Julio Cesar Chavez and the sadly late and flamboyantly great Hector Comacho Sr. I tend not to contemplate such match-ups. They’re called fantasy fights for a reason and the best we can do is to remember past fighters with the respect that they deserve. May 2nd will establish a champion on the night but boxing history is star studded with ring legends and we shouldn’t need a mega bout to recall their names. Even in the long list that spring to mind, there are those whose stories transcend the sport that made them and none…certainly none that I know of…capture the nobility of the fighting spirit more than the ‘The Saint Paul Thunderbolt’ Billy Miske. Born in St Paul, Minnesota on February 16th 1894, Billy first laced leather in the days when professional boxing was illegal in his home state. He travelled with a troupe of fighters that staged exhibition matches and he varied between light heavy and heavyweight as bouts arose. This was a time when boxers made little and fought often and, with a wife and young family, Billy was known to fight 17 or 18 times a year. As the pro ranks became accessible, Miske found himself comfortable at the 180lb to 190lb limit and that qualified him as a heavyweight back in the days when giants were merely figures of fiction. Not only was he a heavyweight but he was regarded as a damn fine pugilist and he was seen as that exciting breed of fighter who went to war when the bell rang out. 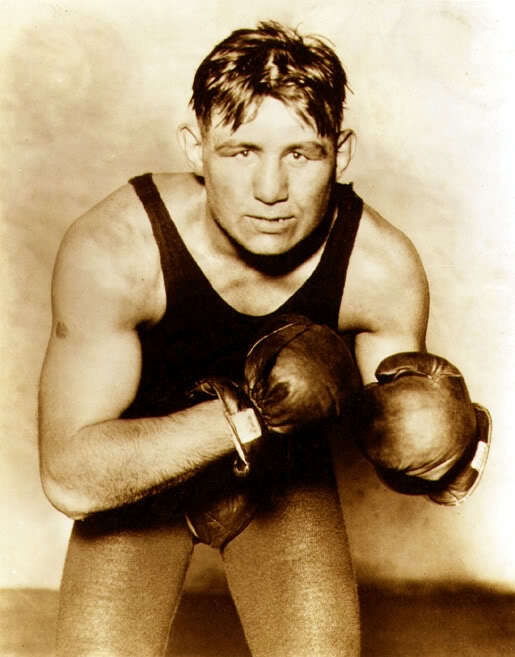 By 1918, Billy was a highly regarded contender with big wins over tough guys like ‘Battling’ Levinsky (32-5), ‘Gunboat’ Smith (48-16) and Jack Dillon (86-3) but it was in May of that year that Billy Miske staked his claim with an exciting draw against the great Jack Dempsey. Most observers had Miske winning the bout but a stunning 7th round gave Dempsey a share of the proceedings. It was 1918, boxing was finding its feet in the towns and cities across the states and the war to end all wars in Europe was finally over. But Billy Miskes toughest battle was just beginning and, sadly, it was one he fought alone. In preparation for the Dempsey fight, Billy had complained to his friend and manager Jack Reddy that he had felt fatigued from time to time and it was a concern to him. Reddy suggested he may be run down from constant ring activity and suggested he see a doctor. The doctor felt it best that he undergo tests and a few weeks later he was called in by his medical team. The news was not good and Billy was not simply drained from over training. He had Bright’s Disease, an incurable kidney ailment and, at best, he had 5yrs to live. He was told that he would never fight again and that his functions would begin to fail over time. The medical team told him to rest and make his peace with God. He thought of his wife Marie and their children Billy Jr, Douglas and Donna. What would become of them when he was gone and how would they manage with an ailing patient and the medical bills that would surely follow? He decided it was his responsibility to carry such worries and he felt it best to tell them of his illness only when he really had to. He told Jack Reddy and made him promise to keep the news secret until he decided to disclose it. He would simply ignore the disease and continue as normal. With an uncertain future ahead, Billy decided to invest his money on the hope of providing for his family when he was gone. Although he was a fine fighter and a formidable opponent for any man, he was no businessman and he followed bad advice when he pumped his life’s savings into an ill-fated Elgin automobile dealership. Not only did he lose his investment but, as the dealership continued to lose money, Billy found he was fighting just to cover his loses. By now, his health was beginning to fail and he was suffering at the hands of men he’d easily beaten in the past. Some of these were punishing affairs and he was knocked out by Dempsey in September of 1920 in a world title bout that didn’t make it past the 3rd round. Reddy approached him and, motivated only by concern for his charge, he begged Billy to consider retirement. But there were debts to be paid and provisions to be made and life would continue with or without him. Not to be outdone by illness, Miske trained harder than ever before and began an amazing winning streak that saw him notch up 19 wins between 1921 and 1922. But, by the end of that year, Billy’s health had deteriorated to a shocking level. He fought once at the start of 1923 and notched up another win but the game was up and the life and career of ‘The Saint Paul Thunderbolt’ should have faded out after that. Throughout 1923, Billy’s strength waned and he rested often. He told Marie that he was simply tired and that he would speak to Jack when he was ready for his ring return. He finally covered his losses at the Elgin dealership but, facing into the second half of the year, Miske was broke and Christmas was coming. It would be his last, he knew that. His 5yrs were up and he could feel the end coming with each passing day. He wanted to leave his family with only good memories and he knew only one way to make that happen. He went to see his old friend and he asked for one more fight. Reddy refused absolutely but said he would help Billy by raising a few dollars. Miske declined the offer and Reddy later recalled the conversation to a sportswriter of the day. “I’ve never taken a handout” Billy said “and I won’t start now. Jack I’m flat broke and I just want to give Marie and the kids a decent Christmas before I check out. You gotta get me a payday….for old time sake”. Reddy protested that, in his condition, Billy could die in the ring and he asked if he was well enough to train. “I’m a fighter” Miske replied “I’d rather die in the ring than slip away in a rocking chair. I’m too weak to train but I need this…my family needs this…and I’m asking you to do this as my friend and not my manager. Please Jack…don’t let me go this way”. Reddy agreed but, if the fight was to amount to a respectable payday, Billy would have to fight a contender and that opponent would be the fearsome ‘KO’ Bill Brennan who had knocked out 48 men on route to his 51 wins. The bout was made and, on November 7th 1923, Billy Miske stepped through the ropes in the City Auditorium, Omaha, Nebraska in the most important fight of his life. Both Miske and Reddy knew that Billy would not last the distance and the decision was made to go early and give it everything in the early rounds. For the first 2 rounds, Billy managed to stay out of trouble but the onslaught would come sooner or later and, when Brennan attacked in the 3rd, Reddy was seen at ringside screaming for Miske to pull out. Brennan landed big shots but Billy held on in an attempt to weather the storm. As ‘KO’ Bill went for the kill, it looked as if Miske’s hopes were in vain. He staggered onto the ropes but, as Brennan came forward, Billy landed a wicked left that stunned his opponent. He followed up with a savage barrage that knocked Brennan out through the ropes and onto the journalist’s sitting ringside. Bill managed to climb back in and was saved by the bell on the count of five. In the 4th, Billy came out like a man possessed and he opened up on Brennan. A massive right cross sent Bill to the canvas and he was counted out. Billy left the ring with a purse of $2,400 and said his final farewells to the jubilant crowd as they applauded the great man for the last time. The Christmas of 1923 was a happy one in the Miske household. Billy bought a piano for Marie and bestowed gifts on his young children. But, as the day passed, he felt his strength leave him and he sat by the fireside as night descended. He told Marie that the fight had taken it out of him and he asked that he be allowed to rest a while. As the family slept, Billy remained seated and looked upon his legacy with pride. The bills were paid, the debts were covered and there was enough to see Marie through the dark days that would follow. Early on the morning of December 26th 1923, Billy phoned his old friend Jack Reddy. “Come and get me Jack” he said “I’m dying”. On the way to the hospital, he finally told Marie the truth and, in the early hours of New Year ’s Day 1924, Billy Miske ‘The Saint Paul Thunderbolt’ slipped away peacefully in St Mary’s Hospital surrounded by his family and his one true friend Jack Reddy. Billy Miske never held a title. His name does not sit in the record books alongside Dempsey and the greats. But he was a champion amongst men and his legacy is filled with a bravery and nobility that will not be outdone by purses and records. He is a lost legend that must be remembered when boxing turns another corner in the days ahead.